WOODNAT was present at the IV Meeting of the Reforestation group of the Spanish Society of Forest Science which was held in Alcázar de San Juan (Spain) in October 17th, 18th and 19th in collaboration with the Spanish Association of Terrestrial Ecology (https://reunionsecfaeet.es). The scope of the meeting is mainly scientific, and several research communications were presented combining more applied research projects dedicated to reforestation and some other more basic research more focused on terrestrial ecology. 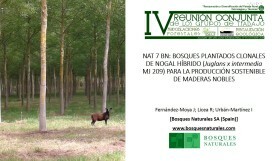 In this scenario, Bosques Naturales presented an oral communication showing the field performance of the NAT 7 commercial clon in the different regions in Spain where the company own and manages their planted forests (Galicia, Toledo, Cuenca and Girona). The data showed the results of clonal planted forests with age between 8 and 15 years old and was evaluated using the site quality classes reported by Montero and Cisneros (2006).